USI All Purpose Windows & Doors supplied all of the exterior glass, windows and some of the interior glass on this commercial building project for the Carbon County Courthouse and Administration building. This glass installation project has a prominent low emissivity glass curtain wall section, which opens to the lobby. 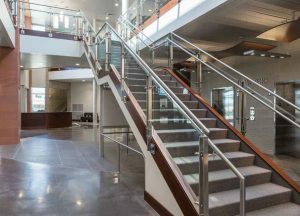 Utah Construction & Design magazine named it a Most Outstanding Public (over $10M) building project.